SAN FRANCISCO -- Lon Simmons, a Hall of Fame broadcaster whose career spanned five decades calling San Francisco Giants, Oakland Athletics and 49ers games, died Sunday. He was 91. The Giants announced that Simmons had died "peacefully," saying, "The Giants family and Bay Area sports community lost a true gentleman." Simmons was one of the original voices of the Giants when they moved West in 1958, and he covered Hall of Famers Willie Mays and Willie McCovey, Juan Marichal, Gaylord Perry and Orlando Cepeda. Fans remember Simmons as the soundtrack to Summer Nights and even when they weren't at the ball park, they say he made them feel part of the game. "You don't hear voices like that no more, said to say you know the commentators on the games these days don't have pizzazz," Carl Payne said. "You know I know he's up there in the great Giants booth up in the sky watching down on all the future Giants games," John Kreslake said. San Francisco Giants President and CEO Larry Baer said, "Like many fans, my earliest Giants memories were listening to Lon and Russ on my transistor radio. Hearing his broadcasts ignited my and thousands of others' passion for Giants baseball. He will be deeply missed by all of us." Simmons called Oakland's victory in the earthquake-interrupted 1989 Bay Bridge World Series, with that booming voice, announcing, "The A's have won the World Series in a sweep!" Over three stints with the Giants, Simmons considered one of his greatest thrills getting to call Mays' 600th home run. His signature phrase on the longball became, "Tell it goodbye!" 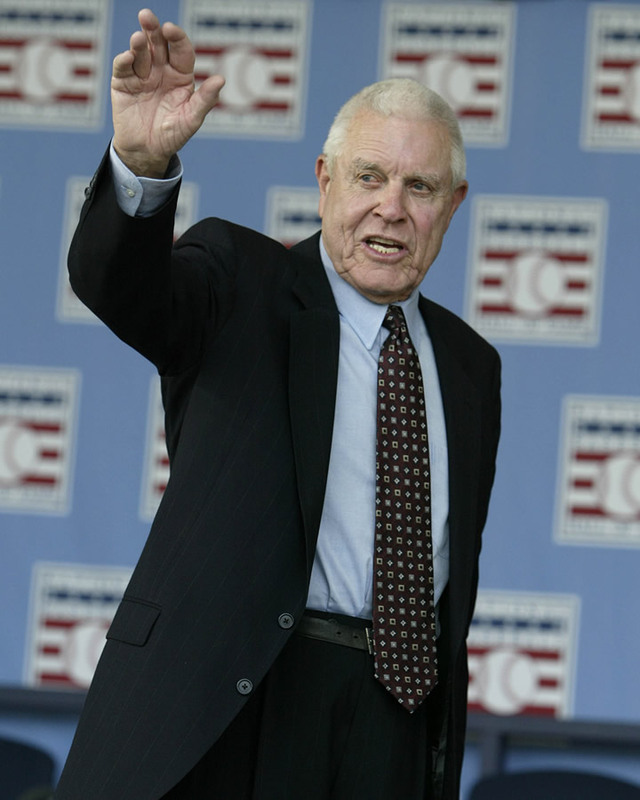 Lon Simmons, the longtime voice of baseball in the Bay Area, waves at the end of the 2004 National Baseball Hall of Fame induction ceremonies July 25, 2004 in Cooperstown, N.Y.
"If they had a Nobel Prize for baseball, Willie would have won it," Simmons said during Mays' 80th birthday festivities in May 2011. He also announced many of home run king Barry Bonds' drives during his pursuit. But Simmons, who was honored with the Ford C. Frick Award by the Hall of Fame in 2004, also had a famous call on Hall of Fame quarterback Steve Young's epic, back-and-forth game-winning scramble for 49 yards against the Minnesota Vikings on Oct. 30, 1988, that still lives in the memories of Bay Area sports fans. "Young, back to throw, in trouble, he's going to be sacked. No, gets away, he runs, gets away again, goes to the 40, gets away again, to the 35, cuts back at the 30, to the 20, the 15, the 10. He dives. Touchdown, 49ers!" 49ers CEO Jed York issued a statement saying: "The 49ers family was deeply saddened to lose one of our own today with the passing of Lon Simmons. Much more than an iconic voice in the great history of Bay Area sports, Lon shared his passion for this region's teams with generations of fans. For more than two decades 49ers fans were treated to the great talents of a man of high integrity and tremendous humility. Whether it was a game-winning touchdown pass from Joe Montana to John Taylor or the miraculous scramble by Steve Young against the Vikings, he brought some of our greatest moments to the world. The 49ers organization is honored Lon Simmons played such a special role in our history. We extend our prayers and deepest sympathies to his loved ones." The San Francisco Giants issued a statement saying: "To Giants fans everywhere, his voice was synonymous with Giants baseball for five decades. Best known for his booming baritone voice, encyclopedic sports knowledge, flair for the dramatic and self-deprecating sense of humor, Lon was the link between generations of Bay Area sports fans and their hometown teams. He was a legend among Giants fans, whose career with the team spanned five decades - beginning when he joined Russ Hodges in the broadcast booth during the team's first season in San Francisco in 1958. Simmons and Hodges worked together for 13 years. And added, "Lon will be deeply missed by the entire Giants family and our thoughts and prayers are with his daughters Robin, Cindy, Lisa and Kelsey." And the Oakland A's issued a statement saying: "Today the Oakland A's join the rest of the Bay Area and the sports world in mourning the passing of Hall of Fame broadcaster Lon Simmons. Lon was a member of the A's broadcast team for 15 seasons (1981-95) and called some of the greatest moments in Oakland history, including the final three outs of the A's 1989 World Series championship. His humility and humor made him one of the most beloved figures in franchise history, which makes today such a sad day for A's fans and baseball fans around the world. Lon was an incredible broadcaster, but his personality and wit set him apart as one of the game's all-time greats." Simmons who spent much of his time in the radio booth alongside Russ Hodges - dealt with cancer more than once in recent years. He requested not to have a memorial service, the Giants said. He attended selected games last season and still worked as a community ambassador for the Giants after retiring in 2002. "I'm grateful for the support of the Bay area fans," Simmons said upon being selected winner of the Ford C. Frick Award. "The fans are more important to me than anything else because those are the people I tried to please the 40 years." Larry Baer on Lon Simmons: "Like many fans, my earliest @SFGiants memories were listening to Lon and Russ (Hodges) on my transistor radio."